To really set the stage for this story, we have to turn back the clock two years. 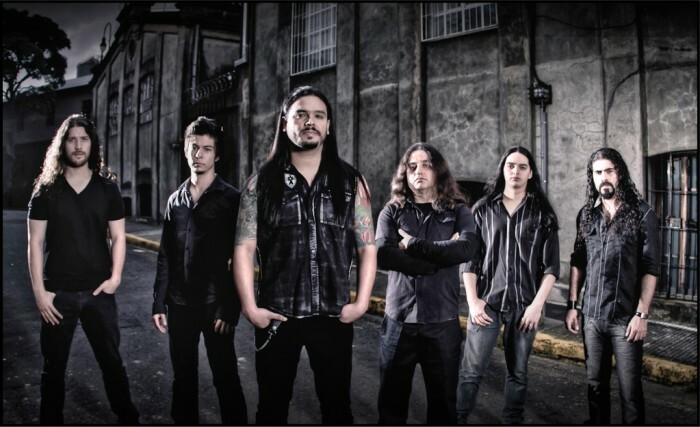 In January 2010, we found out about a very impressive melodic death metal band from Costa Rica named Sight of Emptiness. What got us hooked were three songs from the band’s second album, Absolution of Humanity, that were then streaming at MySpace, plus a cool video of the band performing a fourth song — and we wasted no time posting about Sight of Emptiness here. We wrote about them again in September 2010 on the occasion of the band’s release of a video capturing their performance of the song “Burning Silence” in front of 15,000 people in San Jose, Costa Rica, when they opened for Megadeth. Since then, the band have continued to perform and to build a an international fanbase — and to write new music. And today we’re stoked to give you the world premiere of a new Sight of Emptiness single — “Transition”. It’s a killer song — one that rolls like a blast-wave of explosive detonation from start to finish, one that hits that sweet spot where the flash of cathertic high-energy intersects with shimmering melodies. It also reflects positive growth and evolution in the band’s sound. In addition to the song, we’ve also got a short interview with the band and another video — after the jump. So, “Transition”: This fast-paced song displays a step-up in technicality, with sharp, jabbing riffs reminiscent of Decapitated and weapon-like rhythm bursts, yet those ingredients are coupled with swirling melodic guitar solo’s that turn the song into something even more dynamic. “Transition” also includes some cool (though brief) bass solo’s, which are always welcome around here, and there’s a real headbanger of a finish. Vocalist Eduardo Chacón also sounds naaasty. Q: The new single is entitled “Transition”? Where did that name come from? A: TRANSITION: Yes, that is the title of our newest song, or at least the last song that we have recorded professionally. Why “Transition”? Well it has to do with a lot of positive changes within the band, new blood (members) and the experience we’ve been achieving over the years as a band — never afraid of changes and always willing to get better in each instrument and as a team. Q: What caused you to release this new song now? A: We’ve been writing a lot of new material since the release of our second album, “Absolution of Humanity” (December 2009). So we asked ourselves a few months ago: Why we don’t release a new song (single) to celebrate with the best and most loyal fans around: “La Familia S.o.E” ( that’s how we baptised our fans long time ago), to mark the beginning of the new year 2012, and to show a small but killer preview of what people can expect from us and our third album (to be recorded later this year)? Let’s do it boys, let’s get in the studio and create some magic together. Q: Will this song be part of that third Sight of Emptiness album? A: We don’t know if this song is going to be part of our third album. That is something that only time will tell. We do have lots of new songs, riffs, ideas, etc; so it will be really hard when it comes time to decide which is the best material for the new journey. Q: Tell us about how this song was produced. It sounds immediate and powerful. Who did the recording work? “Working with Sight of Emptiness was a great experience. All the bases were covered, the songwriting is amazing, as is the level of musicianship of each of the members. There is no weak link in the band, so all I had to do was focus on capturing the sound and everything flowed. About the song: This is a departure from S.o.E’s earlier sound, which took me by surprise; but in reality, after many lineup changes in the band, this is the first time this new and hopefully definitive lineup can show what they are made of. The songwriting is more creative and shows off musicianship without showing off, which is something I really respect. The music and lyrics push and blur the lines between different styles found in metal without sounding like it’s being done intentionally. The song is awesome. Q: What about the mastering on the song? Who did that? A: For the mastering we worked with a legend: Peter In de Betou from Tailor Maid (Arch Enemy, Dimmu Borgir, Septicflesh, Meshuggah, Emperor, Hypocrisy, Bring Me The Horizon, Shania Twain, just to name a few). Peter’s 30 years of experience really makes a difference when it comes to delivering a great product. Besides that, he is truly a gentleman who understands with great passion what your needs are in order for your music to reach the next level. Can’t go wrong with someone who has actually worked with such big and diverse artist like the ones I mentioned before, right? Q: So, where are you headed? What comes next? A: This song is Chapter #1, more cool stuff related to this track is coming your way very soon my friends, so keep checking NCS and our Official Facebook page for updates. And to close this out, here’s a video montage of the Sight of Emptiness trip to Tegucigalpa, Honduras, for a performance at the Nacional de Ingenieros Coliseum on December 17. I studied Spanish for 7 years somewhere back near the Cretaceous period, and I can still only understand bits and pieces of what’s being said. But it really doesn’t matter — the spirit of metal comes through. It’s a globe-spanning genre of music and a globe-spanning culture: Language is no barrier, is it? By the way, this trip looks like it was a hell of a lot of fun. The vocals and bass really stood out in this song. I don’t remember the earlier posts about these guys, but I can see why you’d be stoked about them. No entendí nada pero… yeah.!!!! The vocals, sound so wild, so great, but, I dont like too much like the vocals on the Absolution..
And the bass..Esteban is brutal with that bass, sounds epic..
tuve el placer d star esa noche en tegucigalpa.. buena banda!! sigan adelante amigos ticos!! Hail Metal!! muy buena rola.. una pregunta.. es esta la rola q tocaron como regalo esa noche?? ya que no la habian estrenado.. Consider my interest more than piqued. Is that Horatio Sanz on drums?